All single valves, matched pairs and matched quads are fully tested in our warehouse before dispatch. These valves will guarantee awesome tone and amazing power. You WILL hear the difference. So get your amp sounding like the day it left the factory. Order your replacement valves today. Need a Replacement EL84 Valve Quad for Your Guitar Amplifier? This replacement valve kit includes 4 x EL84 matched valve/tubes. These premium quality valves give superior tone and power. So get your amplifier sounding better than ever with this stunning guitar amplifier valve set. The best value for money amplifier valves on the market today from the superb JJ factory. 4 x digitally matched and tested EL84 power valves/tubes. We always recommend JJ valves. This is because they guarantee a superb tone at a very attractive price. Remember, JJ is one of only four valve manufacturers in the world. So don’t pay more for rebranded valves from exactly the same factory. 4 x EL84 Valve set: Guitar Amplifier Compatibility. This quad will work with any amplifier that requires 4 x EL84 matched valves. If you are unsure if this quad will work with your amplifier contact us here. You can also order all our amplifier valves singly or as matched pairs and quads but it is always recommended that you change all your valves at the same time if you possibly can. 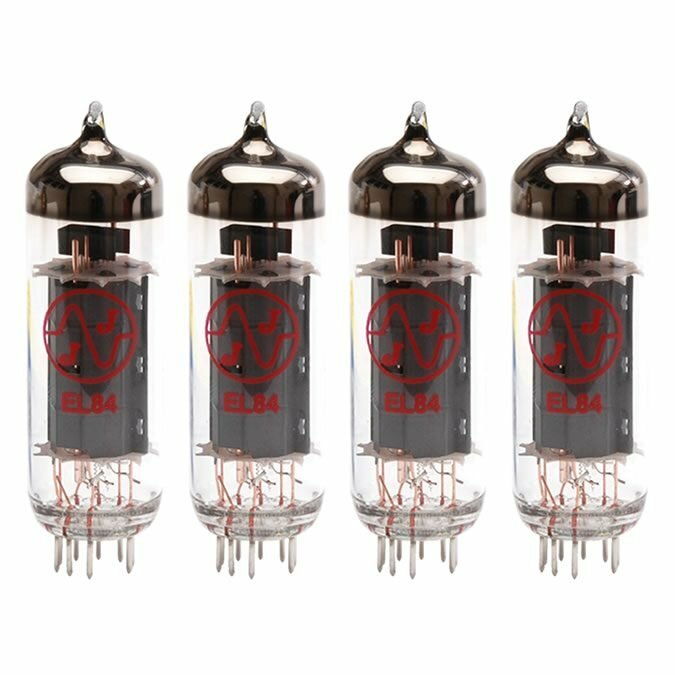 Restore the original power, clarity and sparkle with your 4 x EL84 matched valve quad for guitar amplifiers. So treat yourself to a brand new set of valves today. Awesome tone. The number one priority for any guitarist has to be the tone of the amplifier. Warm, rich, fat and juicy are the words that best describe the sound from these valves. Sustained valve power to make the most of every stage in the amplifier chain. It is the balance between volume and tone that distinguishes a great valve from a mediocre valve. Long valve life. Guitar amps have to be built to take a lot of knocks. This is also very particularly important when it comes to the amplifier valves themselves. Remember, JJ is one of only four valve manufacturers in the World. Do you have any questions about the replacement valve set with 4 x EL84 matched power valves? If you have any questions about replacing your existing valves please drop us an email. We have many years of experience so we are sure we can help you solve any problem. The best replacement 4 x EL84 matched valve quad on the market today. All of our valve kits are carefully chosen, fully tested and digitally matched before we ship them to you. Fast delivery options. Fully tracked and insured. 30 years of experience in the industry. So order with total confidence. All valves are 100% fully guaranteed. We ship all over the world every single day. Why Use a Matched Pair or matched Quad of Valves? In a guitar amplifier with two output valves, in simple terms, one valve is pushing the speaker cone and one is pulling it. In an amp with four output valves, the same applies but the amp has twice the power. With the same signal applied to each valve in the pair, you can see that it’s important that each valve gives an identical amount of push or pull. If this was not the case, sound fidelity would be lost. So you MUST replace all the output tubes at the same time and you should buy your EL84 matched quad from a reputable dealer. At AmpValves we carefully test and match by hand every single valve. A matched pair or quad means each valve gives the same bias current under identical conditions of plate voltage and grid bias voltage. These superb amplifier valves fit many different guitar amplifiers produced by a variety of different manufacturers. EL84 valves have a very specific sound so please check the exact valves you need for your amplifier by clicking here. Fitted these today – awesome difference. But then my previous set were 6 years old! Thanks. Bought these for my AC30 C2. Been using it about twice a week for four years with the original Chinese stock valves – needed replacing after it started making a right horrible noise every time it was warming up. These JJs are a great replacement. It’s much clearer, not too bright or harsh and the volume’s increased. Great Valves fitted them into my Jackson Ampworks Newcastle 30. Great service from ampvalves too really quick delivery. Just spot on ! Thank you for the great service. Fitted the valves yesterday and biased them, my Marshall Stack sounds brand new! I would recommend AmpValve to all.